To celebrate John Peel’s birthday we recently shared some old posts on facebook and twitter and that prompted one reader to enquire about The Sewing Room. We did some digging and now thanks to Eamonn Davis of the band we have their 1996 session for John Peel. The Sewing Room were Stan Erraught (guitar & vocals), Eamonn Davis (guitar & vocals), Colm Fitzpatrick (bass & vocals) and Dez Foley (drums & vocals). Stan was of course previously a member of The Stars Of Heaven, Eamonn and Colm were in Hey Paulette while Dez was in Wilder and Crumb. For more background on The Sewing Room check out the excellent post by Stephen Rennicks on his ‘Abstract Analogue’ site. PS If anyone has a recording of the as yet unlocated RTE Dave Fanning session please get in touch..
Dave Fanning interviews John Peel (at the BBC studio?) in London. Am guessing this took place in 1990 as they refer to John’s 50th birthday celebration the previous year. Not sure how much if any of the interview is missing as Dave had a 3 hour show from 10pm – 1am at that time. If anyone has memories of this broadcast please share. Dave plays a session track from Honeythieves while John chooses ‘Born Annoying’ by Helmet and a romanian folk song. 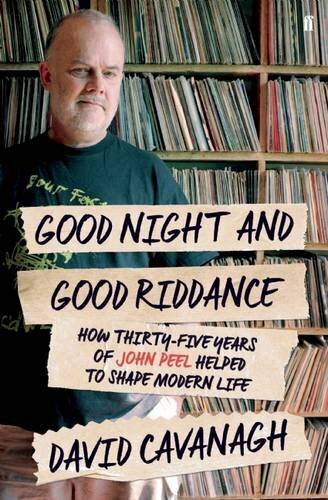 David Cavanagh talks to Dave Fanning about his book ‘Good Night and Good Riddance‘ on legendary BBC DJ John Peel. It’s an interesting interview for a number of reasons one of which is that David himself listened to Dave Fanning’s radio show while growing up in Belfast. And also because Dave could be considered our John Peel and has possibly suffered the same fate at the hands of RTE that Peel did at the BBC. The book wouldn’t exist without the excellent John Peel Wiki which has been archiving and cataloging all Peel radio shows for too long too mention. It’s hard to imagine now what the landscape was like 30 years ago. Imagine you’ve just moved to a foreign country with very limited access to media in your native tongue and even less of a clue where to hear good music. Imagine the shock and delight when you stumble by accident at an ungodly hour across the unmistakeable voice of John Peel and realise that he has a monthly show on a local radio station. These shows become something you look forward to, record and listen to over and over until the next edition. This day 9 years ago John Peel left us. If you are in Dublin tonight you might like to check out the festivities at this event. For more John Peel action check out this list of Irish John Peel Sessions, John playing Teenage Kicks twice in a row or the Peel sessions of The Vipers, Hey Paulette, or all John Peel related posts. There were Irish radio tributes last night on Tom Dunne (Newstalk) and Paul McLoone (TodayFM) and tonight from Dave Clarke (RTE 2fm). If you havent already check out the John Peel Wiki. These folks have been digging out recordings of John Peel shows for years and have catalogued and shared a large number of John’s shows and much more besides. There is a Yahoo mailing list and they are always open to helping track down or identify recordings. Their work as well as the work of Ken Garner, author of ‘The Peel Sessions‘, shown above, inspired the creation of this site. I saw ‘Good Vibrations‘ a second time and enjoyed it just as much as first time round. Favourite scenes include Terri’s first listen to ‘Teenage Kicks’ and John Peel playing said record. Congratulations to all who played a part in making the movie a reality. As a tribute here’s something I came across recently..
It’s been well documented over the years both in magazine articles and various TV interviews that John Peel played this record twice in a row stating, ‘I’m going to do something I’ve never done before’. This is also what he says in the excellent ‘Good Vibrations’ film. It’s sort of gone down in Undertones folk law. Interestingly though (unless he played it twice in a row on two occasions which I don’t think he did) he didn’t actually say that – as this clip proves. I believe there are two reasons why this misconception has arisen. Firstly, as far as I am aware, this sound bite has not been available to hear since its broadcast in 1978 and, secondly in subsequent interviews Peel stated that he played the record twice in a row and hadn’t ever done that before. So this statement became part of what he actually said at the time with nothing to prove otherwise. It’s all semantics of course. All that matters is that he played this awesome record twice.